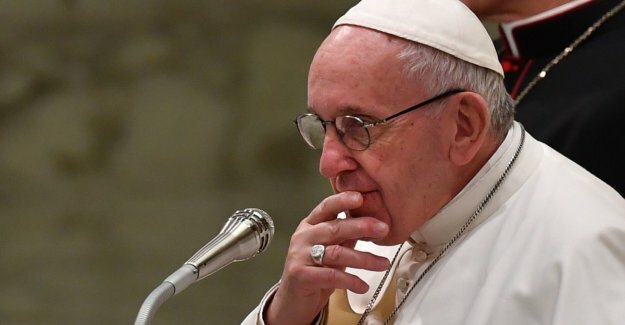 Pope Francis confirms that sexual abuse of nuns, and a case where a nun is used as a sexslave, has taken place in the catholic church. He also believe it still takes place today. - I think this is still in progress, it is not so that something disappears the moment one becomes familiar with the problem, he stated to the press during his journey in the middle East on Tuesday. the Pope believes the church has a problem, and that the root of this is that the women here have been regarded as second-rate. To the press explained to the pope that his predecessor, pope Benedict, at some point has had to dissolve a catholic order, because the sexual abuse had been a problem. According to the BBC, this should have been about an order of France in 2005. He emphasized that it is not so that priests and bishops most do this, but that "scandal" has been known for the church for a while, and that it is something the church is working seriously with. In the wake of the #metoo - the movement has more the nun stood up with his stories. A few days ago went to the Vatican kvinnemagasin, Women Church World, and condemned the abuse, and said that the nuns and in some cases had been forced to abort ministers children - something that is forbidden in catholicism.